BodyBurner PRO is based on an innovative and complex combination of up to 15 active ingredients that provide only 2 capsules per day for high performance. Thanks to its constituent components, it can contribute to mental focus during certain physical activity, and with proper exercise regimen and with proper nutrition it can help regulate or stimulate the metabolism of fat, carbohydrates, fatty acids, protein in the body. The synergistic effect of BodyBurner PRO and its 15 active ingredients makes a winning combination especially for people who are engaged in some physical activity and with proper nutrition. Regular exercise with balanced nutrition, rich in fruits and vegetables, has a positive impact on the health of the body and contributes to a better quality of life. 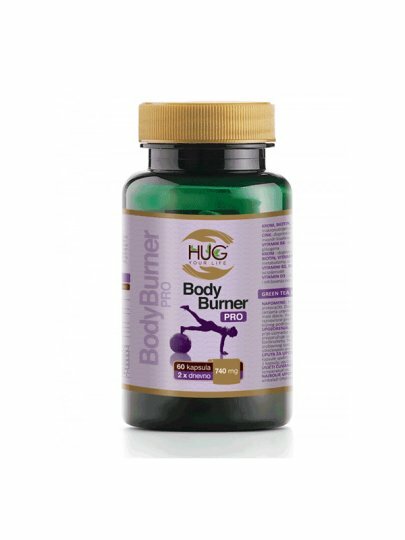 BodyBurner PRO - an innovative formula to stimulate the metabolism of macronutrients in just two capsules per day. conjugated linoleic acid (from Carthamus tinctorius safflower seed), dry garlic garlic extract (Garcinia cambogia), L-carnitine-L-tartrate, thickener: hydroxypropyl methylcellulose (capsule), dry green leaf extract (Camellia sinensis), chitosan, zinc (Piper nigrum), cholecalciferol, pyridoxine hydrochloride, riboflavin, chromium picolinate, lithium dihydrate, L-methionine, antifoaming agent: talc, L-lysine hydrochloride, antifoaming agent: magnesium salts of fatty acids, , cyanocobalamin, color: titanium dioxide. It is recommended to take 1 capsule in the morning and 1 night. On training days 1 capsule in the morning and 1 capsule 30 minutes before training. Save in a dry and dark place at a temperature of up to 25 ° C.